Larry Mason was born on July 25, 1936, in Missouri. He enlisted in the Aviation Cadet Program of the U.S. Air Force on May 26, 1958, and was commissioned a 2d Lt and awarded his pilot wings on September 1, 1959. Capt Mason served as an active duty Air Force pilot from September 1, 1959, to August 16, 1966, during which time he flew combat missions as a B-57 Canberra tactical bomber pilot with the 8th Tactical Bomber Squadron at Clark AB in the Philippines, and deployed to South Vietnam, from October 1965 to July 1966. He served in the Air Force Reserve from August 17, 1966, to February 9, 1967, and then with the Michigan Air National Guard, from February 10, 1967, to February 6, 1968. 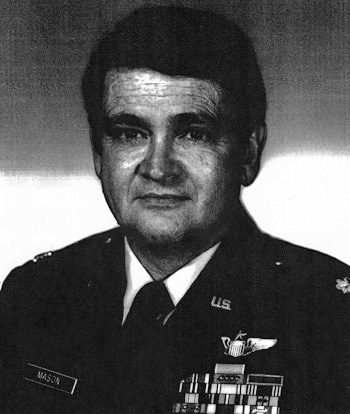 Col Mason then returned to the Air Force Reserve, where he flew transports with the 13th Military Airlift Support Squadron at McChord AFB, Washington, from February 7, 1968, to June 1972, and then assigned to the 9001st Air Reserve Squadron at Lowry AFB, Colorado, from June 1972 until his retirement on February 1, 1983. The President of the United States of America, authorized by Title 10, Section 8742, United States Code, takes pleasure in presenting the Air Force Cross to Captain Larry B. Mason, United States Air Force, for extraordinary heroism in connection with military operations against an opposing armed force as an Aircraft Commander of a B-57 tactical jet bomber of the 8th Tactical Bomber Squadron, Clark Air Base, Philippine Islands, in action on 15 March 1966. On that date, while attacking a heavily defended target, Captain Mason's aircraft was hit repeatedly by 57-mm. and 37-mm. shells which set fire to the right engine and created extreme vibration in the left engine. One shell exploded in the rear cockpit, wounding the navigator and severing a section of wiring which deprived the crew of most electrical power. Wind, blasting through a large hole in the fuselage, scattered dirt and debris around the cockpit temporarily blinding Captain Mason. As he regained his sight, he realized that a safe bailout could not be affected because of the wounded navigator's condition. With one engine shut down and the other on fire, and with approximately 30 square feet of surface missing from the right wing, Captain Mason, with complete disregard for his own personal safety, attempted the return flight to his home base. Flight conditions were further hampered by inoperative radios, no hydraulic pressure or oxygen, severe airframe vibration, and no indication of gear position or fuel level. Through outstanding airmanship, he piloted his crippled aircraft to a safe landing in friendly territory. 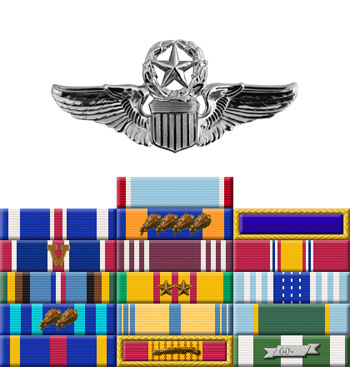 By his extraordinary heroism, superb airmanship, and aggressiveness in the face of the enemy, Captain Mason reflected the highest credit upon himself and the United States Air Force.